New York - On February 27, 2010, an 8.8-magnitude earthquake hit Chile. There is an active ROCOR mission in Chile. Not one member of the mission perished, but one third of the parishioners in Concepción – the earthquake’s epicenter – lost their homes, two families lost everything, and the family of the head of the mission and only ROCOR priest in Chile, Fr. Alexis Aedo Vilugron, lost the majority of their possessions. Donations began flowing in to the Fund for Assistance several days after the earthquake. Gathered funds went to pay for food, water, repair of houses, and clothes for the victims, medical costs and education for the children of poverty-stricken families, as well as to support Fr. Alexis’ family. 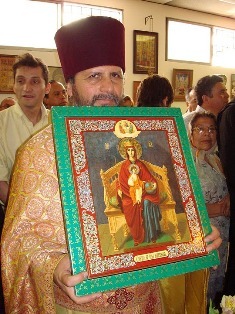 “Thanks to you, we have a smile on our face and peace in our hearts, that it is so important to be God’s witnesses and share the spiritual and cultural treasures of the Russian Orthodox Church with our neighbors,” wrote Fr. Alexis in an e-mail. Three mission parishes currently operate in Chile – in Santiago, in Concepción, and in Valdivia – each of the other parishes is 500 kilometers from Concepción. Every two weeks, Fr. Alexis travels 6-7 hours to the parishes to serve Liturgy. Fr. Alexis has one set of vestments and one of liturgical implements, which he packs into a suitcase for his travels around the country. “This suitcase is my parish,” jokes Fr. Alexis. The mission currently has no churches: they serve in private homes, gymnasiums, and even in a Lutheran church. The mission has big plans, however: they are planning to regularly rent a home for divine services in Santiago and Valdivia, later building a church: “This will immediate fortify the mission,” says Fr. Alexis. Fr. Alexis’ main emphasis is on attracting youth to the Church, and he performs a great deal of missionary work. The mission is constantly growing, and many local Chileans are preparing to be baptized. “My daughter and granddaughter converted to Orthodoxy thanks to the work of Fr. Alexis. He is a true apostle. He draws people in with his faith and love,” said Santiago parish secretary Elizabeth Yurlov. The situation in the country is improving, and now the mission’s chief necessity is rent to pay for more permanent premises in which to conduct divine services.